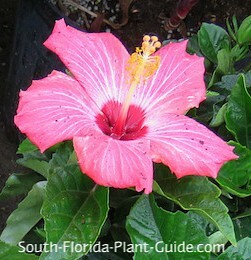 What's a South Florida yard without a hibiscus? With a veritable rainbow of flower colors to choose from, this shrub is one of our most popular landscape plants - with some of the showiest blossoms on earth. 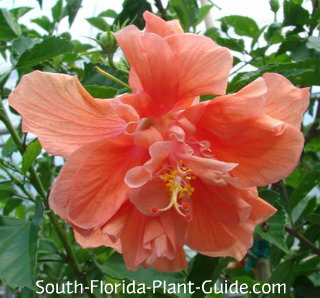 It's one of the most commonly used Florida flowering plants, but with good reason - gorgeous blooms. There are so many varieties to choose from...blossoming in red, pink, white, orange, yellow, and even violet and lavender, with hundreds of exotic color combinations. Flowers range from saucer-sized singles to ruffled double blooms, multi-colored ornate to strikingly simple blossoms. Some cultivars have colorful foliage, such as the beautiful green and white Snow Queen or hybrids with unusual pink-red-purple mottled leaves - all set off by deep red flowers. 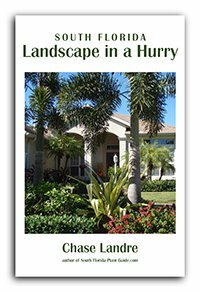 These tropical shrubs make wonderful accents or flowering hedges and go well with any style landscape. 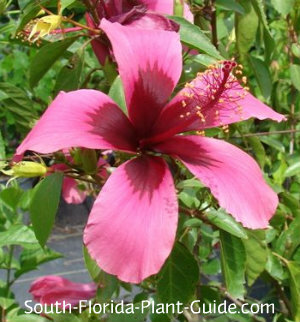 You can often find many bush varieties as standards (trained to tree-form), and of course one of the most popular small flowering trees in South Florida is the weeping hibiscus. 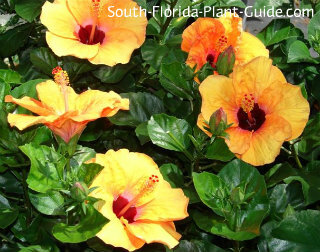 There are many hibiscus societies in Florida and around the world, as well as collectors of exotic cultivars, and nurseries who specialize in this lovely plant. Some towns like Punta Gorda put on annual festivals dedicated to it. This shrub flowers on and off all year (more in warm weather). For most varieties, each flower lasts only one day, but on a thriving plant you'll have buds bursting into bloom to quickly replace fallen blossoms. An exception to the one-a-day rule is 'Hula Girl.' Its flowers - big yellow blooms with red centers- last on the plant for several days, making the shrub extra showy. Hula Girl can be hard to find but your nursery may be able to order it. Warning: A fallen flower from one of these plants can be a foot traffic hazard - squishy and slippery. It can also stain surfaces like concrete, so keep this in mind when choosing a place to plant. Though there are a lot of people out there looking for it, there is no true dwarf variety. Sure, you might see plants marked as dwarf at box stores. The truth is that the plant has been chemically treated to stay small...but without reapplying that growth regulator, your plant will become full size pretty quickly - usually outgrowing the dwarfing agent in about 6 months. These plants are moderately salt-tolerant. They love the sun and do best (and flower the most) in full to part sun locations. Evergreen fast growers, they can be kept 4 to 6 feet tall. This tropical plant can be hurt by cold and does best in Zone 10. 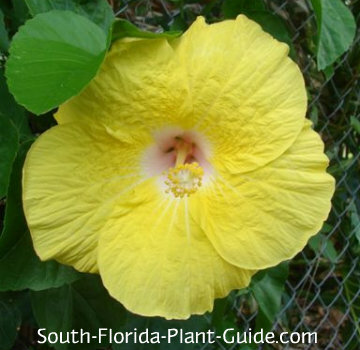 A hibiscus bush can be kept about 3 feet tall when young, and 4 to 6 feet tall as it matures. Add top soil or organic peat humus, mixed with composted cow manure, to the hole before setting in the plant. 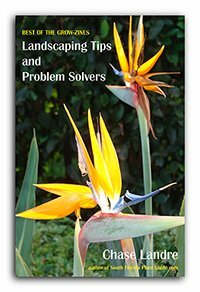 Trim anytime for shape and do a hard pruning in spring (late March to early April) for size. Give this shrub a regular drink. Too wet or too dry and it will become unhappy and look scraggly. Fertilize 3 times a year - spring, summer and autumn - with a quality granular fertilizer. You may want to supplement feedings with applications of bone meal and/or liquid fertilizer to promote heavier bloom. These plants can grow wide so place them 3 feet apart. Come out from the house 3 feet. If you're planting along a walk or drive, come in 3 to 4 feet. This shrub will do fine as a container plant. 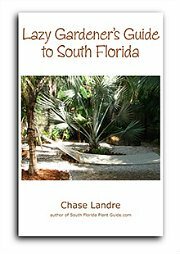 COMPANION PLANT SUGGESTIONS: Gold mound, croton, Panama Rose, oleander, plumbago, Burgundy loropetalum, snowbush, and white fountain grass.